One of the central aims of my time at McMurdo has been to visit the three renowned historic huts on Ross Island. Scott's Discovery Hut on Hut Point just a few hundred yards from McMurdo Station, Scott's Terra Nova Hut at Cape Evans and Shackleton's Nimrod expedition hut at Cape Royd's. A key interest is to see how the technology, methodology and discoveries of science in Antarctica have changed over the last 100 years. The huts are reliquaries of a time when science was done very much by hand. Almost the last gasp of the Enlightenment approach to science when direct personal observation was paramount. This required the early explorer/scientists to deploy their fairly simple analog instruments in the field and then attend them like clockwork - to go out at regular intervals irrespective of how horrible the conditions and reset thermometers, nurse electrical connections, and take readings and make observations in notebooks by (frostbitten) hand. Contemporary scientists can access data remotely (1/2 a world away) or go out to their instruments once every few months to access a data logger that’s been uploading records constantly to a flash drive. My instruments and the way I plan to handle them are more in keeping with earlier approaches. I arrived too late in the season to access Cape Royds, and almost too late to access Cape Evans as I was getting there by skidoo on the sea ice, which this late in the season is starting to melt and get slushy. I managed to get to Cape Evans with the team from McMurdo who were pulling up the red and green flags marking the safe route on the ice, just a few days before the ice was closed to all traffic for the summer. You can see the route across the ice here. North from McMurdo, around to the west of the Erebus Ice Tongue ( a spill of ice pouring off Mt. Erebus and out onto the pack ice), weaving between the Dellbridge Islands and onto the small triangular patch of Cape Evans. About an hour or so by skimobile on a fine day. The Terra Nova hut is the largest and perhaps the most poignant of the Ross Island as it is the base from which Scott left on his fateful expedition to the Pole. I won't recount the history of the hut here - I would just be paraphrasing history researched by others. But I will recommend a wonderful photo documentary of the huts featuring the extraordinary images of Jane Ussher - Still Life: Inside the Antarctic Huts of Scott and Shackleton. The Terra Nova Hut lovingly restored and preserved by New Zealand's Antarctic Heritage Trust. Mt Erebus looms behind. I was delighted to have the opportunity to savor the hut in person. The first things you notice, surprisingly in the cold dry air, is the smell. Not exactly unpleasant but definitely pungent, like old leather mixed with sweat and creosote. The musty, lingering odor of the old explorers perhaps? The next thing you notice is the darkness compared to the blinding summer sunlight reflected off the perennial snow and ice outside. There is no internal lighting and the fact that your eyes take a good while to adjust seems appropriate. It’s as if your own senses have to come up to speed to fully appreciate the textures, memories and emotions of the place. Captain Robert Franklin Scott's bunk. It's interesting to compare with this contemporary image of Scott taken by Herbert Ponting on October 7th, 1911. Each of the Ross Island huts have been visited and photo documented by hundreds (thousands?) of visitors, but an Antarctic blog wouldn't be complete without my own set of images from the huts. I was interested in how much the scientific focus of these missions was apparent in the objects left behind - the impressive sets of chemicals and apparatus, the remaining collections of penguin bodies and eggs, the space dedicated to Ponting's darkroom and the radio bench. There are even some sheets of recording paper from a Campbell-Stokes Heliograph! I didn’t know that Scott had one with him - I’ll talk about this instrument more when I deploy my own version of it at the Pole. Someone took the blue pill! What struck me the most was the clothing still left in the hut. Hard worn, often repaired and now carefully folded. The clothes give the impression that the explorers have just stepped out for a minute. They embody the care, frugality and stark conditions in which these men operated for months and months. The hut seems stark, cold and vulnerable but it was still "home" for the explorers. And there are countless small homey touches everywhere you look. The curved heliograph sheets are on the right hand side next to the reels of linen thread. A jumper carefully mended with sail cloth. Evolution has provided the best insulation. Two essential requirements - dry hand-knitted socks and a "hottie". There was only one item that I was tempted to pilfer - the oilcloth apron hanging on Ponting's darkroom door. Perhaps the strangest part of the preserved hut is the porch where stores were kept and the ponies stabled. One very large component of the distinctive scent of the hut comes from a huge pile of seal blubber carefully laid up in the passageway. With no small critters to nosh on it and the deep freeze conditions outside, the blubber pile is relatively ‘fresh’. The surface of the pile reminds me of a melting glacier front. A blubber glacier slowly sliding out to sea. The strangest (and to me most disturbing) remnant is the largely decomposed carcass of a husky at the end of the stables. I’ve been trying to discover the identity of the poor pooch. The dog was one of the sled dogs bought south for Shackleton’s 1914-17 Imperial Trans-Antarctic Expedition - better known in popular imagination as the Endurance expedition. The heroic tale of the survival of all the men on this expedition is well known, with Shackleton credited as a great and faithful leader as he didn’t lose a single man. The equally heroic B-side of the story of the men who were deployed to Cape Evans on the Aurora to stock depots for Shackleton and his men as they crossed from the other side of the continent didn’t go so well. Ten men were marooned at Cape Evans when the Aurora, containing most of their supplies and equipment, broke anchor and was unable to return (it was also locked in ice for 9 months but survived and limped back to New Zealand). 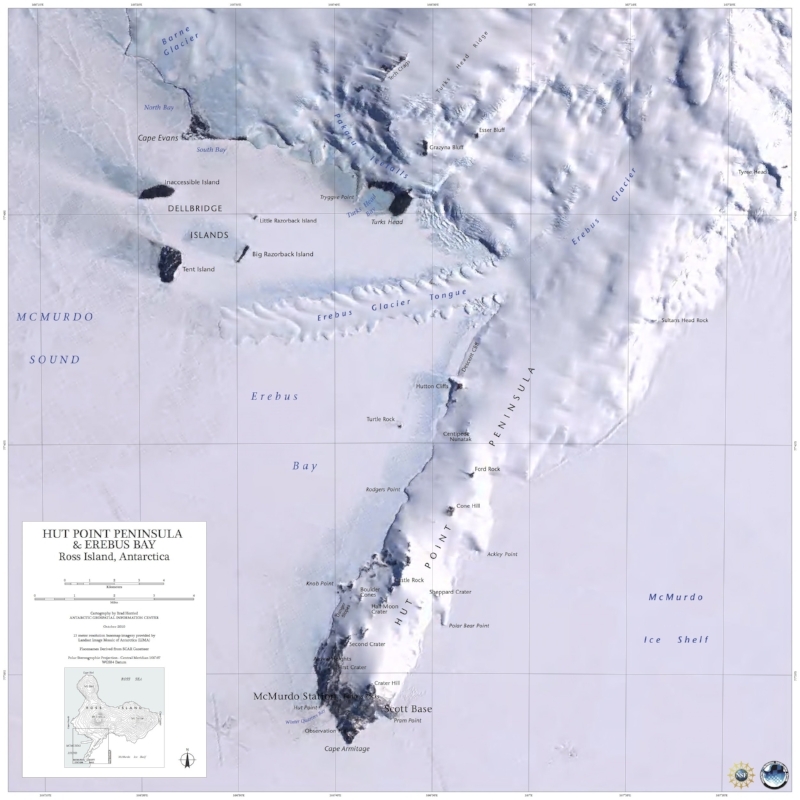 The Ross Island party managed to complete their mission nevertheless (chalking up the longest sledging journey taken at that time - 198 days), raiding the remaining supplies at Point Hut (near McMurdo) and finally losing three men to drowning and scurvy before managing to return to Cape Evans. The dogs they bought with them did heroic duty under the care of Ernest Joyce to bring the survivors home. Finally, Shackleton was able to steam to the stranded men’s rescue. Of the four remaining dogs (of the original 18 on the Aurora), Con was killed by the others in a fight before the rescue. The other three returned to New Zealand and were kept in the Wellington Zoo. Oscar the last survivor lived to a purported age of 25! So presumably the skeleton belongs to poor old Con. The faithful pooch’s corpse had been outside (laying where he died) for most of the last 100 years and was slowly degraded by skuas and rot. The Antarctic Heritage Trust carefully conserved his remains moved him into the porch on a bed of straw where he could rest in peace more nobly.. The hut is an incredible artifact. Carefully catalogued, restored and preserved but still in its original location. All of its objects carry the tarnish of hard use and the slow decay of a century of polar exposure, but still feel useable. Humble things cared for and then abandoned by hard working men and yet powerfully evocative of human struggle and aspiration.